It seems that everyone, even ageing rock stars, wants to talk food these days. Keith Richards devotes four pages - four pages! - to cooking in his autobiography Life, including a philosophical take on shepherds pie - Nobody touches the shepherds pie until I've been there. Don't bust my crust, baby - and an odd but oh-so-Keef story, related by über rock chick Kate Moss, about how he chased a man from his house with two swords for making off with his spring onions one evening. Not a man to take things lightly in the kitchen, clearly. Now. When I was 15, I wore a locket around my neck with a tiny, tiny heart-shaped cut out of Keith inside, a photo taken from the poster inside my copy of Big Hits (High Tide and Green Grass) being, as I was, obsessed with the 1960's (how else was I gonna ride out the 1980's?). So yes, I have a soft spot for Keith and the bio, well, it's horrifying and hilarious by turn. Highly recommended. Had to share this little gem on a sunny Friday. Happy weekend. Fry up a mixture of onions and bacon and seasoning. Get the spuds on the boil with a dash of vinegar, some chopped onions and salt (seasoning to taste). Chuck in some peas with the spuds. (Throw in some chopped carrots too, if you like.) Now we're talking. Now, you have a choice of grilling or broiling your bangers or frying. Throw them on a low heat with the simmering bacon and onions (or in the cold pan, as the TV lady said, and add the onions and bacon in a bit) and let the fuckers rock gently, turning every few minutes. Mash yer spuds and whatever. 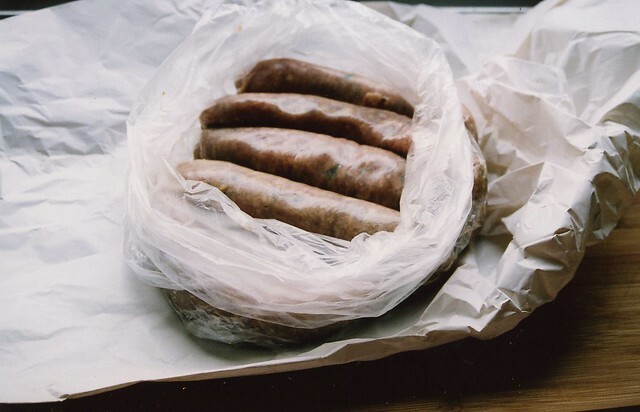 Bangers are now fat free (as possible!). HP sauce, every man to his own.